Minecraft is a massively commercially successful and critically acclaimed multi-platform ‘Open World’ game. In terms of genre (see ‘Genre’ below) it is a Sandbox Indie Game although key focus is on building, strategy and to a lesser extent survival. It was created by Markus ‘Notch’ Persson, a Swedish Computer Programmer who is not a traditional Games Developer which may account for its mathematical, formulaic interface – Minecraft does not attempt to impress with high end representational/cinematic graphics and instead chooses a grid based Voxel graphic format (see ‘Style and Format’) which allows for cuboid building. Persson spent years developing the game himself (thus reducing costs) but was assisted later in the project in projects by Jens Bergensten. The game was first developed and published in November 2011 by Mojang, a company that was originated by Persson from the money made from an Alpha, developmental version in 2009 – between 15 to 20 developers now work on the game. 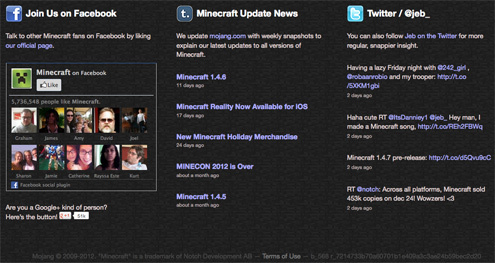 As an indie game Minecraft is technically without a publisher as Mojang do everything from development to promotion. 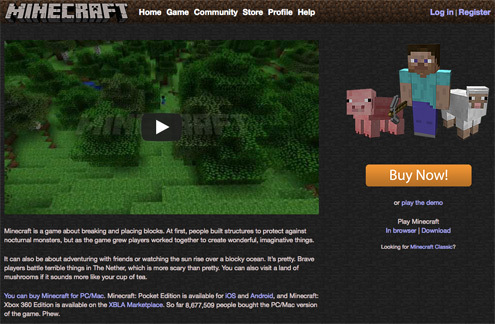 This is including encouraging distribution of the game and selling the game from their own Minecraft website, www.minecraft.net. With ‘Notch’ Persson so pivotal in the design of the game and as originator of Mojang, Minecraft has to be described as an auteur project. Minecraft makes clear intertextual references to Dwarf Fortress, Infiniminer and Dungeon Keeper which is acknowledged by the developer but by 2011 Persson allowed Bergensten to take over full creative control of Minecraft while he remained as developer, choosing instead to focus on a new project – a new space game also being developed by Mojang.